This is Ferocactus wislizeni, one of the barrel cactus family. "Like Sclerocactus, Ferocactus typically grows in areas where water flows irregularly or depressions where water can accmulate for short periods of time. They are most often found growing along washes and arroyos where their seeds have been subjected to scarification due to water movement, but they oddly also tend to grow along ridges in spots where depressions have formed and can hold water for some period of time. 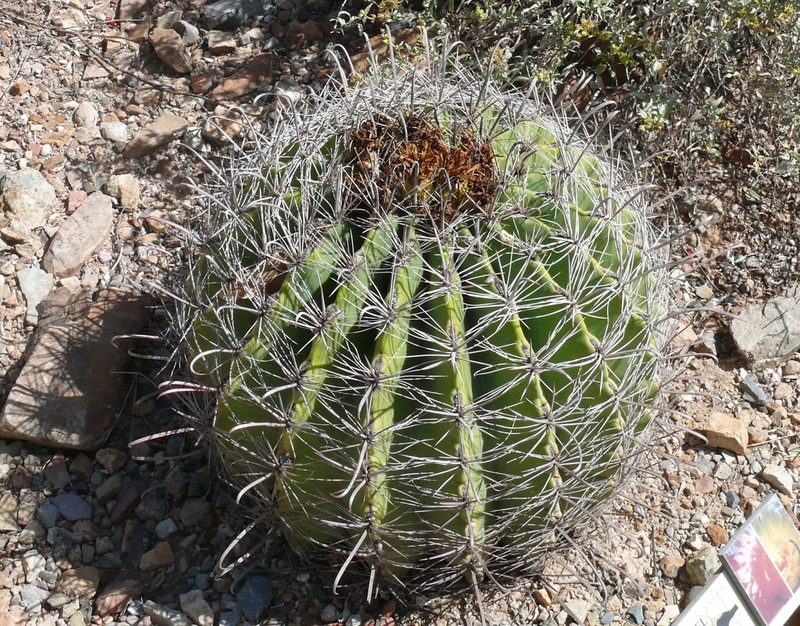 The 'fishhook' spines and the armored web of spines enclosing the cactus body in many species of this genus is an adaptation which allows the plant to move to more favorable locations. This plant's seeds germinate in areas where water movement occurs or in areas where standing water accumulates for some period of time, and during flash floods, the hooked spines allow the plants to be caught on water-borne debris and be uprooted and carried to areas where water tends to accumulate. Ferocactus has very shallow root systems and are easily uprooted during flash floods." Mobile! It hitches a ride to more favorable locations. "Going Ferocactus" just doesn't roll of the tongue like going Galt. "Carnivorous plants are widespread but rather rare. They are almost entirely restricted to habitats such as bogs, where soil nutrients are extremely limiting, but where sunlight and water are readily available. Only under such extreme conditions is carnivory favoured to an extent that makes the adaptations obvious. In general, carnivorous plants are poor competitors, because they invest too heavily in structures that have no selective advantage in nutrient-rich habitats. They succeed only where other plants fail. Carnivores are to nutrients what cacti are to water."